Control charts are a very important tool in quality control. We say “A picture is worth a thousand words” because images are better at conveying complex ideas and most people find it easier to understand large amounts of data visually than in tabular form. Variability in a manufactured product is unavoidable, but it is important to understand if the variability is controlled variation or uncontrolled variation. Controlled variation is attributed to chance or common causes and is a consistent pattern of variation over time. Uncontrolled variation is attributed to assignable or special causes and is an inconsistent pattern of variation over time. 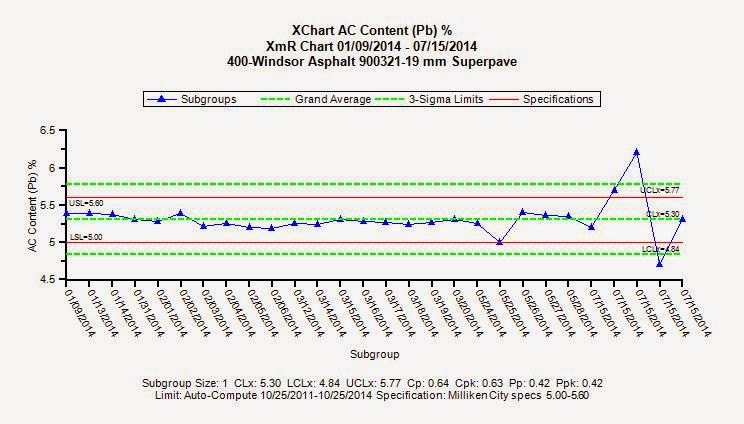 The primary use of control charts is to quickly identify uncontrolled variation attributable to special causes. This can be difficult depending on the type of special cause. Some special causes, such as crusher liner wear, may cause a drift or a slow change to the gradation. Other special causes, such as a change in mix design materials or equipment malfunction, may cause a step-change that is more abrupt (Obla, 2014). In its most basic form, a control chart can be any chart containing control limits. However, the term “Control Chart” is typically attributed to Dr. Walter A. Shewhart and is also referred to as Shewhart Charts or Process-Behavior Charts. Shewhart charts are used to monitor the process average and process variability using either standard deviation or range. Control limits are typically upper and lower boundaries outside of which the process is statistically unlikely to produce results (they represent the limits of the natural process or controlled variation). In other words, control limits should be computed from the process rather than be specified limits, such as specifications. If your control limits are outside of your specification limits then your process is telling you that it is statistically likely to produce failures. Control charts are used to identify signals such as when a data point is outside of the control limits, or two out of three successive points fall on the same side of the average (NSSGA, 2013). Stonemont Software includes rule checking to help identify common signals. differentiate between particular methods of analysis. These charts are very powerful tools that can be used to analyze gradation results as % passing, % retained, or % individual retained; all quality test results, such as FM, AC Content, Specific Gravity, Slump, and Unit Weight/Density; process results such as crusher amps, liner hours; both overall and within batch concrete compressive strength results; and concrete batch results. Run charts are probably the most commonly used chart in Stonemont Software because they are the most easily understood. Run charts show individual data points and the average value with control limits that are +/- 2 x Standard Deviation (SD). When data are normally distributed, control limits at 2 x SD should contain about 95.4% of the data points given a data set of adequate size. Run charts help monitor the process mean and are useful for understanding the relationship between control limits based on 2xSD and specification limits, identifying trends using a best-fit trend line, and changes in mean using a moving average line. In Stonemont Software, our standard control charts are based on Shewhart charts and they provide the ability analyze data as individual charts, average and range charts, and moving average and range charts. Average and moving average charts use subgroups of data points, which have the effect of smoothing out some of the erratic individual data points making overall trends or changes in mean easier to identify. However, individual charts are more suited for data that is collected periodically to ensure that a change in the process is not missed (NSSGA, 2013). 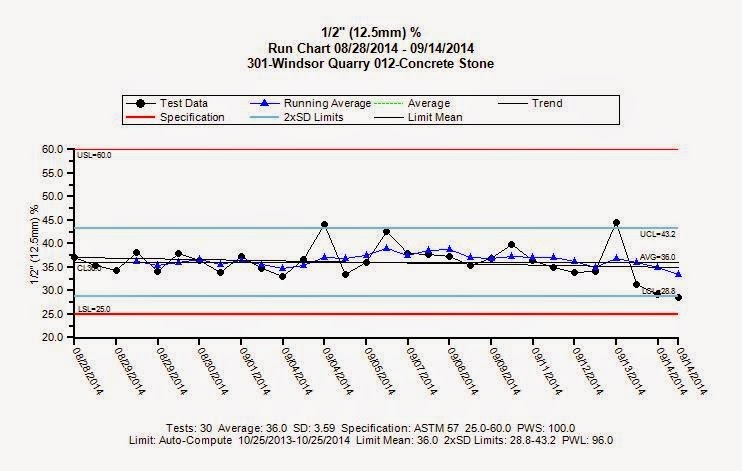 Stonemont Software includes a special control chart for compressive strength data that shows the within-batch variation or the variation between cylinders made from the same concrete sample. 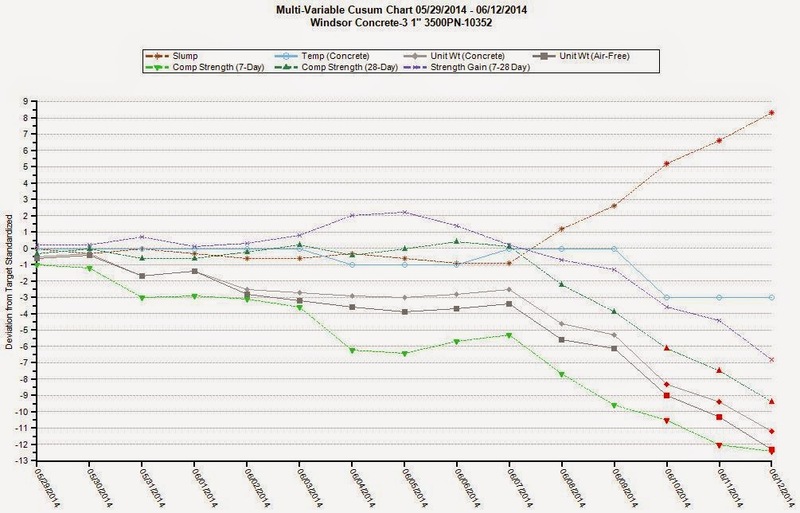 This chart also shows the average, moving average, limits, design and required strengths. The range chart can be the actual within batch range, the normalized within batch range expressed as a percent, or the within batch coefficient of variation (CV), which is used as a measure of testing variability. The user can define a limit when using the range % or CV chart. Cusum charts are designed to quickly identify a change in the process mean or average; commonly a 1 x SD change in the process mean. Cusum charts can be represented either as a standard or tabular form of the cusum. Stonemont Software uses the tabular cusum on individual cusum charts and the standard form on multi-variable cusum charts. The tabular cusum chart is much easier to read and understand because control limits can be used to quickly identify a change in mean. However, a multi-variable cusum chart is useful for identifying correlations of change between variables such as whether concrete compressive strength changes correlate to those of concrete density, slump, or temperature. 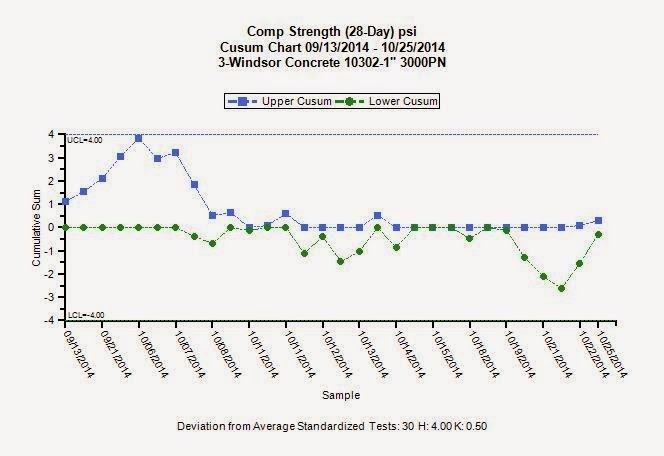 The multi-variable cusum chart shows how changes in the batching process on 6/10/2014 led to an increase in slump and corresponding decreases in unit weight and 7 and 28 day strength results. Based on these correlations it appears that the cause may be an increase in water added to each load. Control charts are an extremely useful tool in quality control. Stonemont Software provides several different control charts, which allows quality control personnel to use the control chart that they feel is best suited for their application. Not only can these control charts be manually generated from within the software, many of these charts can be automatically generated and delivered via email for multiple variables such as the run chart, control chart, and cusum chart auto-reports (auto-reports are available in our enterprise and hosted/cloud editions). Automated reporting is critical for your most common products. 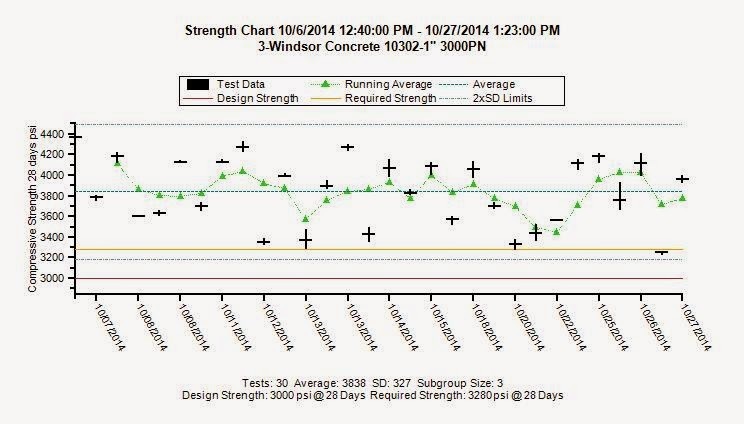 Obla, K.H., 2014, Improving Concrete Quality, CRC Press. NSSGA, 2013, The Aggregates Handbook Second Edition, NSSGA.